Kennebunkport has a cocktail consumption reputation, labeled “a drinking village with a fishing problem,” where the well-healed are well-fueled, Kennedrunkport, Kenneboozeport, lol, I could go on. Suffice it to say the locals and folks from away like their cocktails out & about Dock Square, and liquorin’ up in Lower Village across the bridge. K’port may be Maine’s most socially lubed seaside village. What a distinctive drinking title?! 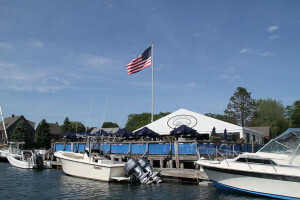 Truly Kennebunkport and Kennebunk have so many lively happy hours, bars, pubs, and waterfront decks where you can drink in the view and a cocktail too. 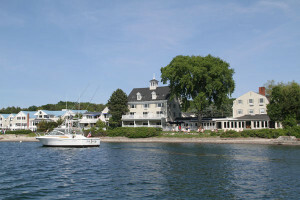 Stripers Waterside at the Breakwater Inn and Spa has a graceful lawn along the Kennebunk River. Order a mojito from the bar then lounge in an Adirondack chair outside – its Maine heaven – as the sun sets its even better, by the firepit. 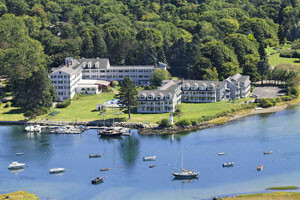 The Colony Hotel has the grandest vantage of them all, overlooking the ocean. Go to the Marine Room and out by the pool for a cool Manhattan at this 101 year old stately seaside hotel in season – May- mid-October. Imagine the fortunate folk who spent their entire summers here back in the day. Cheers. Arundel Wharf has a huge outdoor dock, its casual and convivial – nothing fancy – just where the locals go on sunny evenings from May to September. The Boathouse Bar at the Boathouse Waterfront Hotel has a commanding view of the River, especially from the bar and the outdoor deck. This is a great place for drinks, with a happy hour 3-6 Monday- Friday off season. 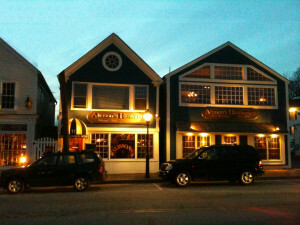 Burleigh at the Kennebunkport Inn has two outdoor patios and a cozy nautical bar inside – home to a Prime steak house. Burleigh is a happening place with Happy Hours every day, and Local Dish on Thursday night when my beautiful friend Lisa sings with a changing cast of musical characters. Alisson’s is the “Cheers” of Kennebunkport. You won’t bump into Norm, Cliff or Woody, but there are other “usuals” at the long wooden bar. Local beers on tap, New England sports on the big screens, it’s a classic watering hole with Maine pub fare. Old Vines Wine Bar is old school cool, with an outdoor terrace and a warm wonderful bistro interior. Old Vines bartenders are THE best, crafting clever cocktails, sharing their lingo and love of the extensive wine and beer pours. A sophisticated small plate menu offers perfect pairings. Pedros is Mexican, obvi – serving fresh margs and a fiesta vibe. Sip on their outdoor patio under a sombrero or inside at the funky bar. Pearl has a Happy Hour 5-6, Wed- Sunday with oyster deals and drink specials! 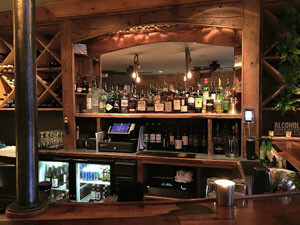 Nonantum Resort’s Heckman’s Pub has an historical Maine hotel feel, with a friendly staff and cocktails infused with Maine blueberries and more local flavors. 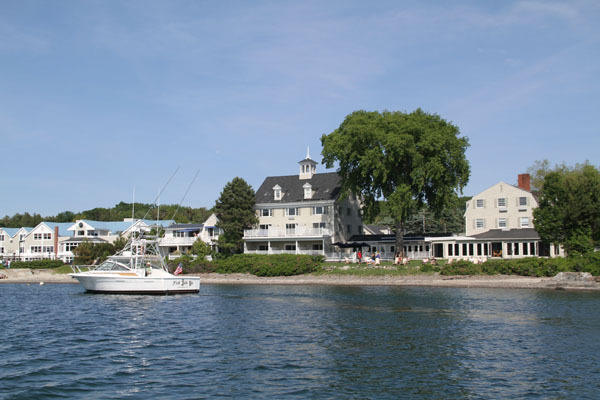 The 1883 Hotel has river view dining at 95 Ocean – with a nightly special, and live entertainment. Admiral’s Table at the Rhumb Line is a relaxed resort cabana bar a few miles for Dock Square. Come for drinks by the pool, stay for a Down East Feast of chowder, clams, lobster and corn at a picnic table. Rhumb Line’s cheeseburgers and fries are cheap and wicked tasty too. 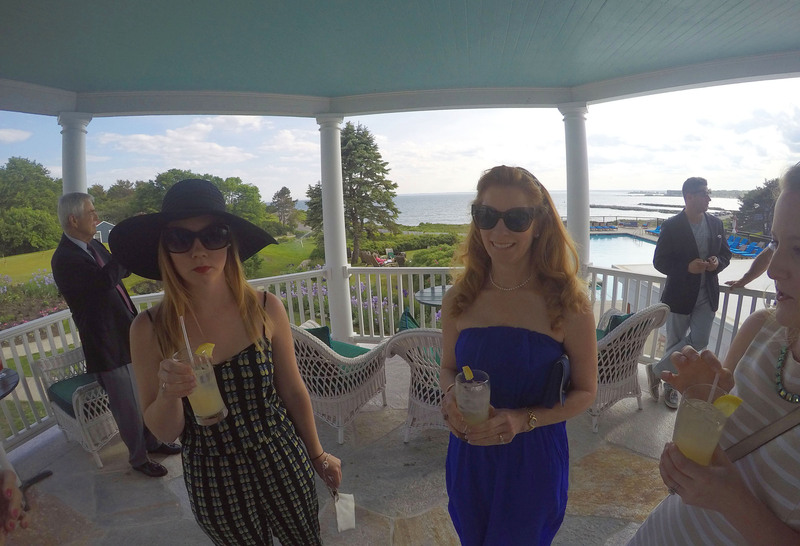 Enjoy your visit to Kennebunkport, and post your best selfies sipping around town – hashtag #LoveKpt. Kennebunkport is easily walkable. Don’t drink and drive, stroll home, call an Uber. Cheers!